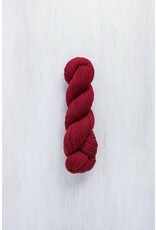 Vale is the laceweight member of Brooklyn Tweed’s all-American, breed-specific core line. This yarn begins on the Wyoming plains with 100% Rambouillet fleece, grown by sheep that trace their lineage to medieval France, where this offshoot of the merino was prized as the king of breeds. Rambouillet is even loftier and bouncier than merino, and we spin it worsted for a soft, springy, durable two-ply yarn that yields ethereal accessories. Scoured and combed into buttery smooth, consistent top in South Carolina, the wool travels north to Maine for spinning at an historic mill and dyeing at an eco-friendly facility nearby. Vale’s custom palette of 14 shades shares some touchstone colors with BT's Arbor line and fills in with sophisticated softer tones.